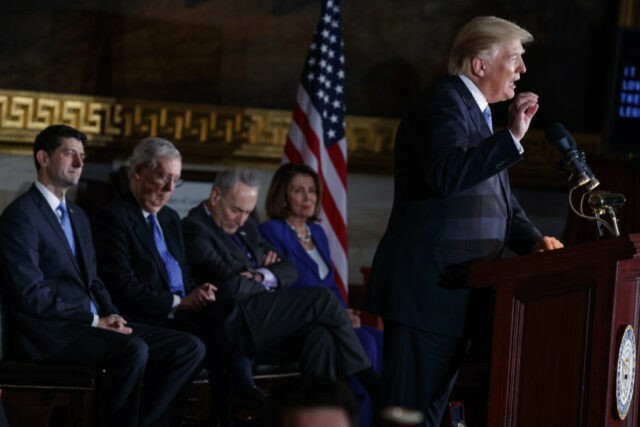 WASHINGTON (AP) — He wrote a book on the art of negotiation and was elected to office claiming he alone could end Washington gridlock, but President Donald Trump’s latest attempt to broker a big, bipartisan deal has turned into a big mess. The failure to find consensus on immigration and spending is a blow to Trump’s presidency on the one-year anniversary of his inauguration — and perhaps more painfully, a blow to his brand as a wheeler-and-dealer. The funding feud, which led to a government shutdown at midnight Friday, is the second time Trump has dived into a negotiation and come up short on a top priority. As with failed talks about overhauling the nation’s health system, Trump has again slammed into the difficulties of Washington’s particular mix of tricky politics and complex policy. Democrats’ agenda in this case is, chiefly, protection for the 700,000 young immigrants who may face deportation when the Deferred Action for Childhood Arrivals program expires in March. Republicans are seeking more time to talk and a long-term funding bill that with major increases for the Pentagon. It’s not been entirely clear what the president’s agenda is. Over the past few weeks, he has expressed openness to extending the DACA program, but then rejected a bipartisan plan on that front. He fired off a tweet that appeared to reject the GOP plan for a short-term funding bill that would buy time for more negotiation, but the White House walked it back. He abruptly tried to cut a broad deal with Sen. Chuck Schumer, the Democratic leader and a fellow New Yorker, and then backed off. Democrats have been less diplomatic: “Negotiating with President Trump is like negotiating with Jell-O,” Schumer said Saturday, gleefully recounting what he claimed was a blow-by-blow account of Trump’s failed efforts to avert a shutdown. The White House doesn’t necessarily view the confusion as a problem. A White House official, who asked for anonymity to discuss private deliberations, said the White House prefers to keep the government open, but sees potential political upside in Democratic “overreach.” Trump’s team sees the shutdown as an example of the president’s commitment to tough negotiation and believes Democrats will cave in, the official said in describing the strategy. It is a familiar sentiment for presidents stuck in crises with Congress. During the 2013 shutdown, President Barack Obama predicted the confrontation would “break the fever” driving Republican opposition — ultimately to no avail. Who bears the blame for the current debacle is difficult to predict. Some Republican critics of Trump said he might emerge reputation intact, should Democrats bear the brunt of the blame. “It’s pretty clear Sen. Schumer wasn’t going to be able to get to ‘yes,'” said Mike Steel, a former aide to Republican House Speakers John Boehner and Paul Ryan. But Trump, himself, has suggested he should be on the hook for the impasse.